Have you recently been told that you need a dental crown? Dental crowns are a custom-created restoration that can completely restore the function and beauty of damaged teeth. Crowns are one of the most popular dental treatments, often used to repair chipped, cracked, decayed, and even discolored teeth. Dental crowns provide many benefits, depending on the reason you need or want a crown. Often referred to as “dental caps,” dental crowns work by covering the entire damaged tooth, in order to form a protective layer over the damaged area. Dental crowns can be used in a variety of cosmetic treatments. They are often used in dental bridge treatments, as anchors to hold the bridge in place over the area where a tooth is missing. Crowns are also used during dental implant treatments as the above the gum restoration that resembles your natural tooth. In other cases, dental crowns are used on their own to restore teeth that are weak from tooth decay, teeth that are worn down from teeth grinding, or teeth that are chipped from a physical trauma. In some cases, dental crowns are used solely as a cosmetic treatment to improve the color, shape, size, and alignment of teeth. There are multiple types of dental crowns available. In the past, the main type of crown was a gold crown. Fortunately, with advancements in dentistry, you can now get a cap that resembles the exact color and shape of your natural teeth. At Dr. Donald L. Cadle in New Port Richey, FL, we will generally recommend porcelain or ceramic crowns for a durable and cosmetically beautiful restoration. In some cases, where a back tooth needs restoration, we might recommend a more durable material, like zirconia. Do I Need a Crown or a Veneer? Like crowns, veneers are a beautiful restoration that can also be used to treat chipped, damaged, or discolored teeth. Unlike crowns, veneers are a thin shell that only cover the front of the tooth, rather than encapsulating the entire tooth. For the most part, crowns and veneers treat the same type of issues. However, crowns come with some added benefits. Dental crowns offer a much stronger restoration than veneers. If a tooth has a fracture in the center of it, a dental crown is able to absorb much more bite pressure than a veneer, which only strengthens the front of the tooth. Crowns are also much more beneficial at restoring teeth in the back of the mouth, since veneers can only be used on the front teeth. Crowns can improve your smile cosmetically. Ceramic and porcelain crowns are a great cosmetic restoration for unsightly teeth. Due to their natural appearance, they are a great choice for broken, cracked, or yellowed teeth. They are also a great cosmetic solution for missing teeth. Protection for weak teeth. When used to treat teeth that have become infected, damaged, or decayed, crowns are a great at serving as protection from further decay. 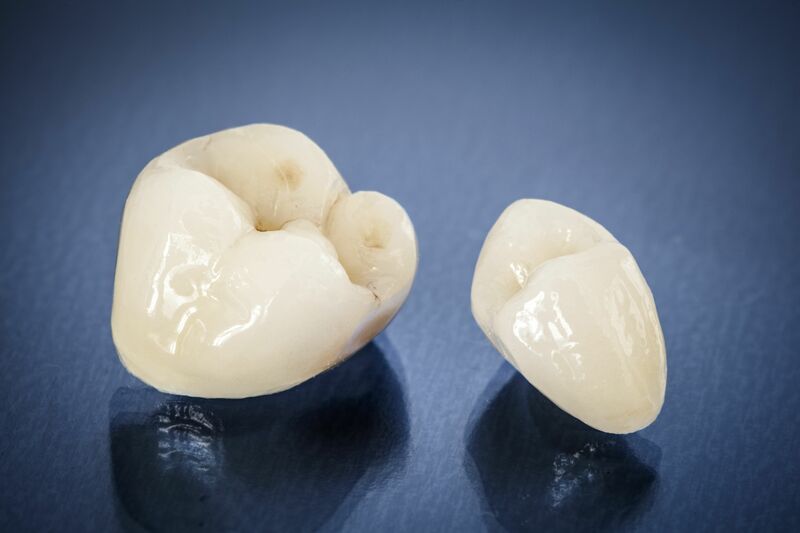 Since crowns fully encapsulate the tooth, they can act as reinforcement for teeth that are already broken or cracked. They can also keep the tooth from developing more plaque and decay. Crowns can restore your speech. Missing and chipped teeth often give patients a lisp, or make their speech slurred. Crowns are securely cemented in your mouth, which can restore your ability to speak confidently without having to worry about your restoration falling out or hiding your damaged tooth. Long-lasting treatment. Depending on how well you look after your restoration, dental crowns can last anywhere from 5-15 years. You can expect to enjoy the benefits of your crown for a long time. After receiving a crown, you will still need to make sure that you are following proper oral hygiene practices by brushing and flossing regularly. This can help ensure that your restoration lasts for as long as possible. You should also make sure that you visit our office every 6 months for professional cleanings, and so we can assess the area, ensuring the restorations remains healthy. If you are prone to tooth decay or gum disease, we might recommend a fluoride or antibacterial rinse. Want to learn more about dental crowns at Dr. Donald l. Cadle, Jr.? Call our office today at 727-312-1300.